The new 2013 BMW M550d xDrive, 335i Sedan and the 335i Coupe are “The sportiest cars of 2013.” What is BMW doing to stay ahead of Audi and Mercedes? BMW is producing the sportiest cars on the planet and it’s keeping them ahead of Audi and Mercedes. BMW is being recognized for their sporty models and have won three place finishes from the readers of the specialist German magazine "Sport Auto" and have named three current BMW models as "The sportiest cars of 2013.” BMW’s are know for their sporty performance and fans around the globe know just how fun they can be to drive. What is BMW doing right? BMW is in a race with Audi and Mercedes who have goals of taking away the top luxury spot from BMW. But BMW isn’t going to just sit on their success. It looks like the German automaker from Munich is going to stay number one for quite some time as they continue to produce quality performance cars. The fan poll isn’t the only way to determine who has the “sportiest cars” in the world, but who better to judge the cars than those who own and drive them everyday? The annual poll was carried out for the first time in 1980, and this year, 15,300 readers participated in the ballot. They were asked to name their favorite cars in 15 categories of production vehicles and in a further 10 classes for tuned vehicles, from a total of 230 current models. BMW scored a hat trick this year with three current models in three different classes. In the diesel category, the BMW M550d xDrive was voted into first place again, continuing the trend it set the previous year. The BMW M550d xDrive features the world's most powerful six-cylinder diesel engine. The 3.0 litre engine develops 280 kW/381 hp and delivers a maximum torque of 740 newton meters. It uses a three-stage turbo-charging and common-rail direct injection to develop the power. The diesel powered M55d xDrive achieves an average fuel consumption of 6.2 and 6.3 litres per 100 kilometres respectively, as determined by the EU test cycle. Two more first-in-class awards were won by the BMW 335i Sedan and the BMW 335i Coupe. For the first time, the new BMW 335i Sedan was voted number one in the category of "Sedans costing under 50,000 Euros". The BMW 335i Coupe was named top of its class by "Sport Auto" readers for the third time in a row. Both cars feature the inline six-cylinder engine equipped with BMW TwinPower Turbo technology. The 225 kW, 306 hp power powerplant gives drivers a “crisp, spontaneous response, superior high-revving characteristics and awesome running refinement.” Those performance characteristics are hard to beat and are keeping BMW number one with performance fans around the globe. This hat trick of the 2013 BMW M550d xDrive, 335i Sedan and the 335i Coupe builds on the excellent results regularly achieved by BMW over a number of years in this definitive, long-established ballot. The "Sport Auto" Awards 2013 will be presented on 12th June 2013 at the Kunstmuseum Stuttgart. Look for BMW to stay the top luxury performance automaker over Audi and Mercedes-Benz into the future. 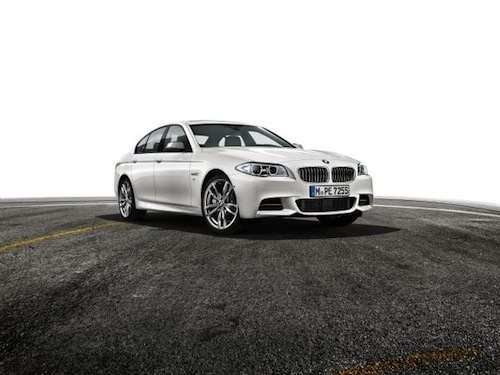 Watch BMW M550d xDrive (2013) video.